For the study of human history, Dr. Montessori designed a long ribbon to give the child a sensorial experience of the passage of the centuries. The ribbon (16’ x 3 ¾”) is divided into two parts: one part is colored white and marks the centuries from 10,000 BCE (before the Current Era): the other part is colored red to emphasize the centuries of the Current Era (CE). The names of the six important historical periods are printed on the ribbon: Prehistory, Egyptians, Classical Age of Greece, Middle Ages, Renaissance, and Modern Time. 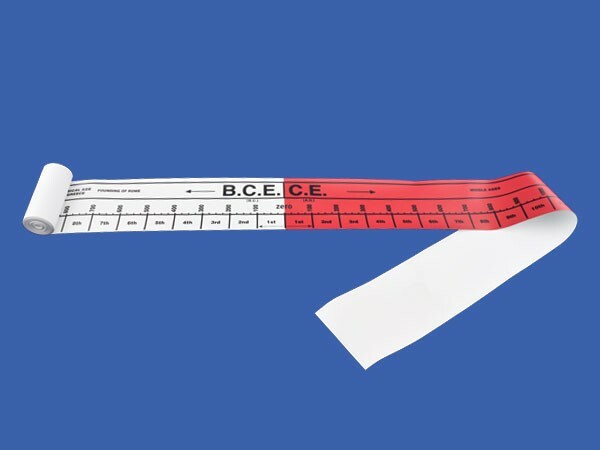 The BCE/CE Time Line Ribbon is particularly suitable for working with the exercises of the Fundamental Needs of Humans where the student can match picture cards, labels, and story cards to the corresponding historic periods. The ribbon is made of durable, flexible, and heavy vinyl. It can be rolled and easily stored in the classroom.